« How do you shoot a troubled pacemaker ? 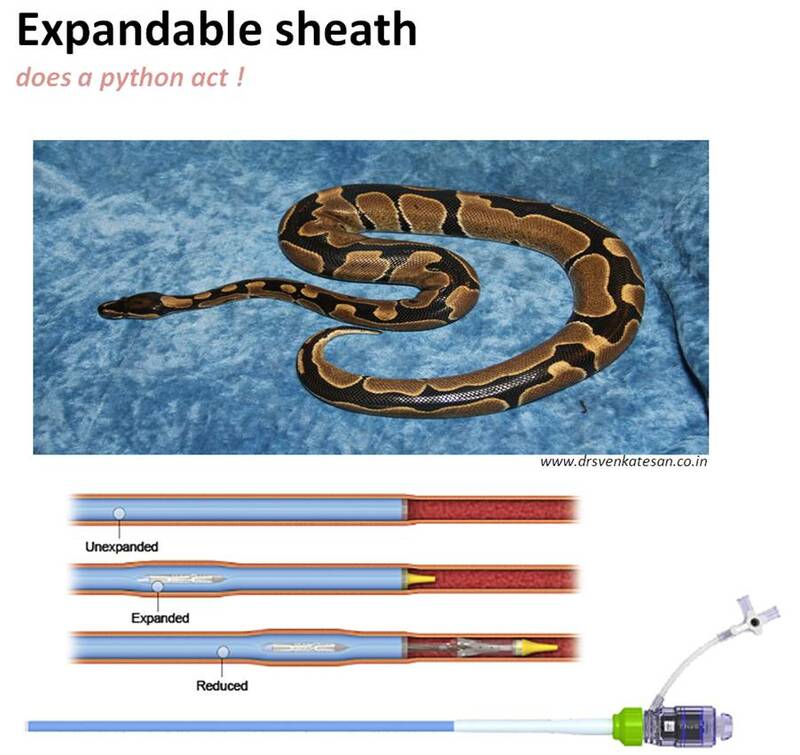 Expandable sheaths and catheters : Does a python act ! Interventional cardiologists in one way be labelled as intra-cardiac and intra-vascular civil engineers.Their primary job is to create ,or close vascular tunnels and holes in various locations within the heart.How to deliver the working hardware to the site of action ?. Temporary bridges ? .The vascular access is through long sheaths though which , wires, catheters, and devices , valves are transported. It’s the key supply line to the ultimate battle field of life , right inside the beating heart. . So far,the sheaths and catheters were rigid tubes with a fixed diameter.Innovative sparks come from strange thoughts.As we struggled to take the per-cutaneous valve for TAVR through small caliber sheaths , some one thought why should the sheath be fixed and static .Why can’t it accommodate liberal sized devices just by expanding its shaft like a python ,come back to its original state once the device passes by ? Thus came the expandable sheaths. Soon this concept is going to come in a big way and most complex and large device interventions will be benefited by this.